A timber weatherboard construction for the Bangalow Courthouse and Police Station in the Federation era style. Built in 1909 the Bangalow Courthouse was constructed alongside the Police lock-up, which had been erected in 1905. At the time Bangalow was described as a ‘budding township’, servicing a developing dairying industry, see location map below. As with any growing community, it needed a police presence with adequate facilities. A number of the original Federation era shop facades lining the main street have been preserved rendering the townscape with special charm. Before the Bangalow police station and lock-up was built Bangalow police were required to transport people in custody to the Byron Bay Police Station. The Northern Star, November 1904. The Bangalow Progress Association reported early in 1909 that the NSW Attorney-General and Minister for Justice approved the erection of a Courthouse at Bangalow, at a cost of £350: the Northern Star, 5 March 1909. The following year in May 1910, the Bangalow Court of Petty Sessions was officially opened, having been officially proclaimed in the NSW Government Gazette No.72, 11 May 1910, p. 2483. It was established under the provisions of section 5 of the Justices Act, 1902 (Act No.27, 1902), NSW. The Bangalow Courthouse was the site of a range of coronial inquiries over the early years. In 1918 a local farmer and three of his children drowned in a well on the farm. On the available evidence the Coroner was unable to find any cause as to how the family came to be in the well. When a deceased swagman was found in scrub in the Bangalow area in 1920, the Coroner was called to inquire into the cause of death, (unknown). In 1928 in another case inquiry was made into the death of a woman knocked down by a horseman while walking along a local road. The Coroner found it was an accident. Five years after the Court was established Police Magistrate Hamblin left for a new appointment in 1915. 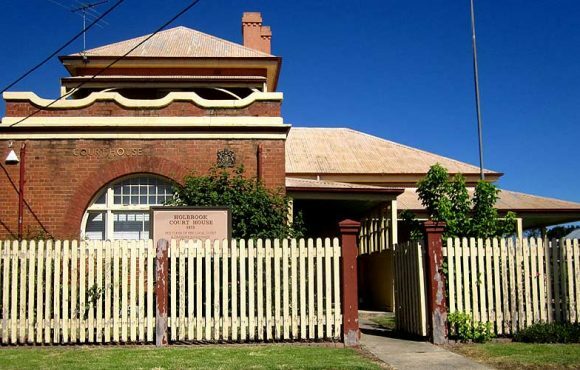 It was reported that the local magistrates met in the Bangalow Courthouse one Saturday before opening of the Court to wish him farewell and prsent him with a ‘token of esteem’. He had lived in Bangalow for some time, administering the law. One speechmaker noted that he was a person ‘..who naturally would be criticised, not always favourably by those losing their cases, to be generally accorded the confidence of the great majority who acknowledged that he had held the scale of justice with an even beam.’ The Richmond River Express and Casino Kyogle Advertiser, 29 October 1915. Location map of Bangalow, northern New South Wales. Bangalow is a short drive from Byron Bay and Ballina, both on the coast. This entry was posted in Australian Courthouses and tagged Courthouse, early Australian Courthouses, NSW, old Australian courthouses by BHS Legal. Bookmark the permalink.